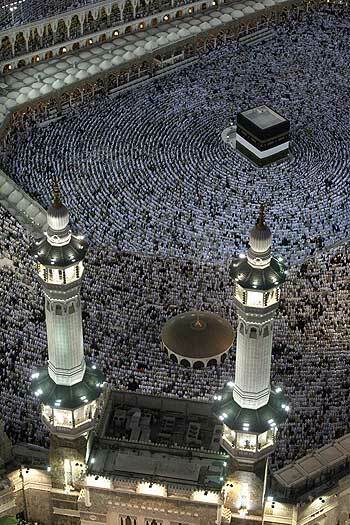 Muslims from all over the world are taking part in the largest gathering on Earth, the Hajj, or pilgrimage to Mecca. The Hajj is a religious obligation that every Muslim must fulfill, if financially and physically able, at least once in his or her lifetime. During these historic days, white, brown, and black people, rich and poor, kings and peasants, men and women, old and young will all stand before God, all brothers and sisters, at the holiest of shrines in the center of the Muslim world, where all will call upon God to accept their good deeds. These days represent the zenith of every Muslim's lifetime. The Hajj resembles the reenactment of the experiences of the Prophet Abraham, whose selfless sacrifice has no parallel in the history of humankind. The Hajj symbolizes the lessons taught by the final prophet, Muhammad, who stood on the plain of Arafat, proclaimed the completion of his mission and announced the proclamation of God: "This day have I perfected your religion for you, completed my favor upon you, and have chosen for you Islam, or submission to God, as your religion" (Quran 5:3). This great annual convention of faith demonstrates the concept of equality of mankind, the most profound message of Islam, which allows no superiority on the basis of race, gender, or social status. The only preference in the eyes of God is piety as stated in the Quran: "The best amongst you in the eyes of God is most righteous." During the days of the Hajj, Muslims dress in the same simple way, observe the same regulations, and say the same prayers at the same time in the same manner, for the same end. There is no royalty and aristocracy, but humility and devotion. These times confirm the commitment of Muslims, all Muslims, to God. It affirms their readiness to leave the material interest for his sake. The Hajj is a reminder of the Grand Assembly on the Day of Judgment when people will stand equal before God waiting for their final destiny, and as the Prophet Muhammad said, "God does not judge according to your bodies and appearances, but he scans your hearts and looks into your deeds." The Quran states these ideals really nicely (49:13): "O mankind! We created you from a single (pair) of a male and a female, and made you into nations and tribes, that ye may know each other (not that ye may despise (each other)). Verily the most honored of you in the sight of God is (he who is) the most righteous of you. And God has full knowledge and is well acquainted (with all things)." While Malcolm X was in Mecca performing his pilgrimage, he wrote to his assistants: "They asked me what about the Hajj had impressed me the most … I said, 'The brotherhood! The people of all races, colors, from all over the world coming together as one! It has proved to me the power of the One God' … All ate as one, and slept as one. Everything about the pilgrimage atmosphere accented the oneness of man under one God." This is what the Hajj is all about. Dr. Ahmad Al-Akhras is the vice chair of the Council on American-Islamic Relations. He has made the Hajj three times. This piece first appeared in The Columbus Dispatch.